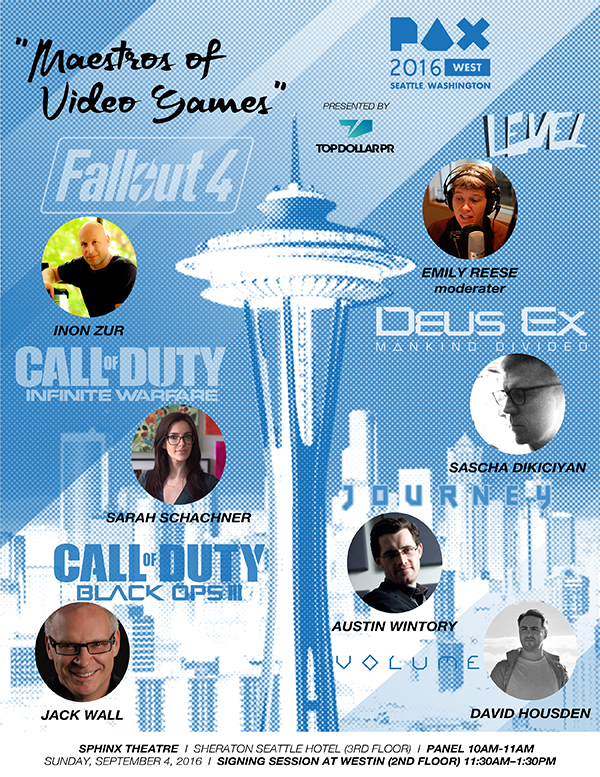 Seattle, WA - On Sunday, September 4, hear from the award-winning composers of ABZÛ, ASSASSIN'S CREED, THE BANNER SAGA, BORDERLANDS, CALL OF DUTY, DEUS EX, DRAGON AGE, FALLOUT, FANTASIA, JADE EMPIRE, JOURNEY, MASS EFFECT, PRINCE OF PERSIA, QUAKE, SYBERIA, THOMAS WAS ALONE, TRON and VOLUME at the 2016 PAX West 'Maestros of Video Games' panel in the Sphinx Theatre, Sheraton Seattle (10:00AM-11:00AM). Then join the composers in the Queue Room, Westin (2nd Floor) at 11:30AM for a meet and greet / autograph session immediately following the panel. CALL OF DUTY: INFINITE WARFARE, ASSASSIN'S CREED UNITY. FALLOUT 4, SYBERIA 3, DRAGON AGE, PRINCE OF PERSIA, EAGLE FLIGHT. CALL OF DUTY: BLACK OPS 3, MASS EFFECT, JADE EMPIRE, INTO THE STARS. DEUS EX: MANKIND DIVIDED, MASS EFFECT 3, TRON: EVOLUTION. ABZÛ, ASSASSIN'S CREED SYNDICATE, THE BANNER SAGA, JOURNEY. VOLUME: CODA, THOMAS WAS ALONE, VOLUME. Moderated by EMILY REESE, award-winning radio host and producer of "LEVEL with Emily Reese" podcast.